The Sonderkraftfahrzeug 251 (SdKfz 251) half-track was an armored fighting vehicle designed and first built by Germany's Hanomag company during World War II. They were produced throughout the war. The early production models of this vehicle were issued to the 1st Panzer Division in 1939. There were four main models (A - D), with many variants. The initial idea was for a vehicle that could be used to transport a squad of infantry to the battlefield protected from enemy small arms fire, and with some protection from artillery fire. The open top meant that the crew was still vulnerable, especially to high explosive rounds and shell fragments. The first two models were produced in small numbers. The C variant had a larger production run, but was a quite complex vehicle to build, involving many angled plates that gave reasonable protection from small arms fire. The D version utilized a much simpler design, and can be easily recognised by its single piece sloping rear (with flat doors). The standard personnel carrier version was equipped with a 7.92 mm MG34 or MG42 machine gun mounted at the front of the open compartment, above and behind the driver. A second machine gun was usually mounted at the rear on an anti-aircraft mount. Variants were produced for specialized purposes, including with anti-aircraft guns, anti-tank rockets (triple Panzerschrecks fitted on either side of the vehicle) as well as a version with an infra-red search light used to spot potential targets for associated Panther tanks equipped with infrared detectors. 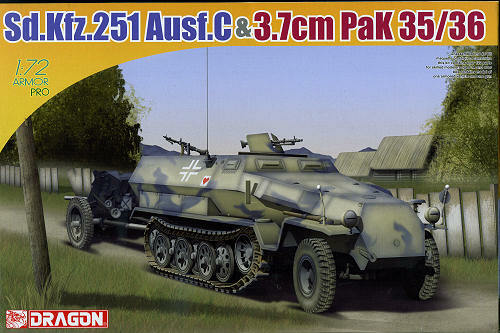 This one is a simple combination of the standard SdKfz 251 APC with a new mold 3.7 cm Pak 35/36 anti tank gun. Both kits have been available separately and now you have the opportunity to get them together. Markings are provided for one vehicle as noted on the box art. This is from the Grossdeutchland infantry division on the Eastern Front during 1942 and in overall panzer grey. The gun is likewise painted. 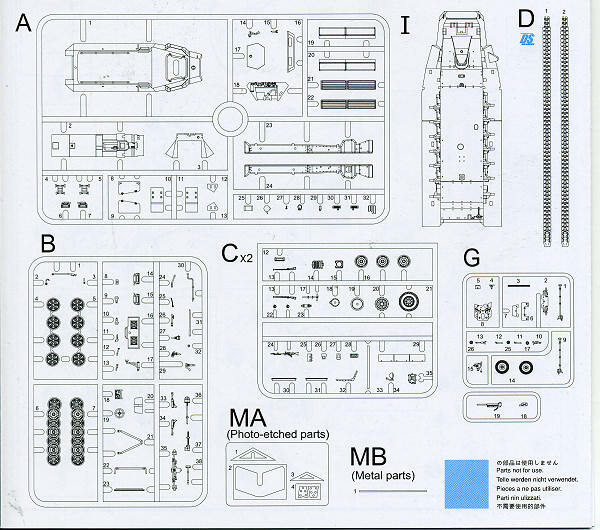 Instructions are typical of Dragon in these kits with Gunze and Model Master paint references. I've built one of these halftracks and it was a pleasant and enjoyable experience. The inclusion of the towed anti-tank gun just makes this kit a much better deal all around.